Monal Marquee is a premier wedding facility in Islamabad, Pakistan. 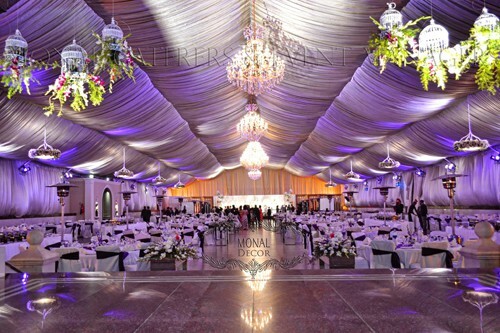 Keeping up its tradition of innovation and elegance, Monal Marquee has redefined the concept of marquees in the city. The insipid encampments have been transformed to give the outlook of classical European palaces. The majestic façades are designed not only to make our clients feel like royalty, but also to provide them the essential facilities required at weddings and other ceremonies. And it is not just the exterior, the granite floors, artistic woodwork, and extravagant chandeliers give our guests the taste and feel of class. You can see and feel the difference the moment you step inside. The marquee floor has been consciously kept below the entrance level to make sure that our guests enter not into a crowd, but an elaborate vista. Highlighting, the more mundane, but most essential, Monal’s are the only marquees to provide extensive restrooms for ladies and gentlemen along with baby change rooms. A bridal room with customized sophistication provides not just privacy and comfort for the bride, but can also be used for a photo-shoot. And to top it all, our countless options for theme, décor and lighting give you a wide choice on how you want to shape the memories of perhaps the most important and beautiful day of your life. Special Services: The only ‘one-window’ catering solution in town! Extra Features: Valet Parking, Back-up Generator, Indoor & Outdoor Air-Conditioning, Abundant Guest Parking, Safe and Secure Environment. What to Expect: A professional and passionate event company that specializes in upscale themed wedding and events. Zoom out map for best view. On IslamabadSnob.com, we send your comments directly to the business owners. This way, owners know the comments are authentic and can address concerns on a personal level. Commenting also helps us to determine which businesses get approved for a listing on our site. When you want a discreet way to express yourself while creating real change and results in our local businesses, you can rely on IslamabadSnob.com.